An amazing and hard to find documentary film about the 2500th anniversary celebrations of Persian Kingdom in Iran. Made live during the festivities where most of the heads of the States of majority of countries in the world attended this unprecedented vent in 1971. Narrated by Orson Wells, now you can watch the entire event on this DVD. Rare footages of Shah and Farah meeting with world leaders and the view from inside the guests tents and the epic parade and much more. This DVD is truly a rare DVD which shows late Shah's efforts to introduce Iran as a great country with such a rich history to the world. The day after the spectacular state banquet was time for another superb moment of the celebrations, undoubtedly one of the greatest parades ever staged, reviewing two and a half millenniums of history, conquests, military power and imperial glory. 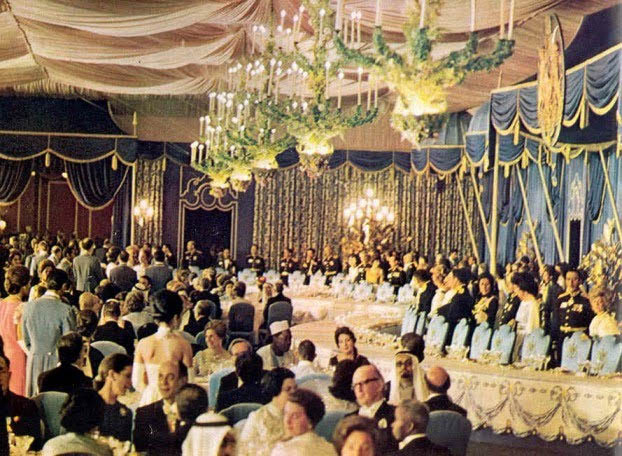 Anyone that might not have been totally impressed by the grand banquet of the eve would surely be definitely convinced by the unique parade of the 15th October, a highpoint of the festivities, whose goal was to give all the guests a taste of what Iran had been in the past, was in 1971 and would be in the future. During the morning, the heads of state, royalty and other representatives of world nations visited the ruins of Persepolis, guided by Their Imperial Majesties and occasionally speaking to the journalists. The relaxed mood continued to set the tone for the second day of the most amazing gathering of world leaders. During the more formal parade, the uniqueness and peculiarity of it brought many smiles to the faces of the guests, sat in a long tribune, set in front of the ruins. Soldiers dressed in ancient Persian uniforms (unlike said at the time, the idea of recreating ancient uniforms from the Iranian organizers and not the French), swords and shields, fake hair and beard, solemnly mounted the ruins and placed themselves in several spots of the ancient Palace of Darius. 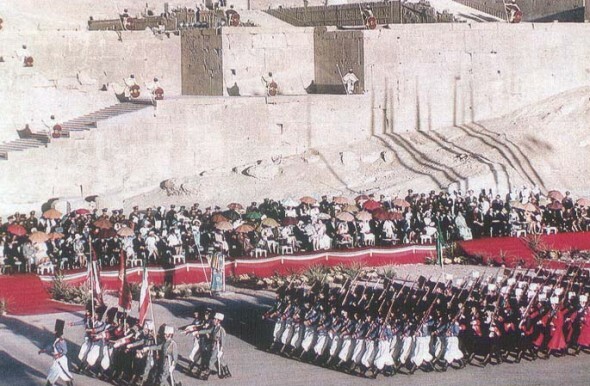 The theme of the great parade was the evolution of the several Persian armies, illustrated by almost 4000 men from the Iranian Army, responsible for this particular part of the celebrations. The event begun with the arrival of two officers riding horses, bringing a message from Teheran to the Shah: the Presidents of the Senate and the Chamber of Deputies had solemnly sent it a few days before, from the doorstep of the Palace of the Senate, after approval by a joint session of the two houses of Parliament. It was a message congratulating the Shah, which had been manuscript in accordance to ancient traditions. Placed inside a box, it travelled through the desert, taken by two officers dressed in Achaemenian uniforms and in horseback, which were replaced occasionally.